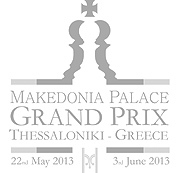 On the second rest day of Thessaloniki Grand Prix the local chess clubs have organized an outdoor simul on Aristotelous Square, the main city square of Thessaloniki. Grandmasters Ioannis Papaioannou (Grand Prix commentator) and Athanasios Mastrovasilis started the event against 50 opponents, but due to high interest of by-passers, finally 70 games were played. Grand Prix participants were giving autographs and posed for pictures.